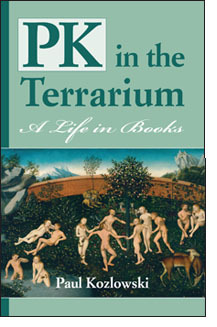 PK in the Terrarium collects the best posts from five years of Paul Kozlowski's blog on his life in books. It's a deeply felt and witty set of essays by an engaged reader, collector, champion and all-around lover of the written word. It is also the tale of a proud bookseller eager to share his passion with a distracted public, navigating a trade in the throes of upheaval and unpredictable change. The diaristic entries deepen and darken as the author's musings on the books he's loved open up to the autobiographical reflections of a man of a certain age in an uncertain age. The eternal desire for reciprocated love. “That’s what it’s all about,” said Quist. “That’s why you do the things you do.” Then he slapped his tobacco pouch on the armrest and took another sip of whiskey. “And the things you’re gonna do." Order from amazon.com or with the widget to the right. Paperback • 160 pages • Black & White • 5.5"x8.5"